This is such a fantastic reminder to us all about gratitude. My wife recently nominated me for the “Gratitude Challenge”, and it rekindled some of my earlier years in the personal development journey. Gratitude was one of the first subjects i studied. Its importance is golden! Being grateful generates more of what you want and lends appreciation to your life’s path. It was one of the easiest starting points to the personal development journey, because we can ALL relate. We have all experienced something good in life we can appreciate and be thankful for. Whether it was a person, thing or specific situation. Tap into that moment and express our gratitude for it. You will feel amazing and actually open up the option for God to bless you with more doses of that moment. 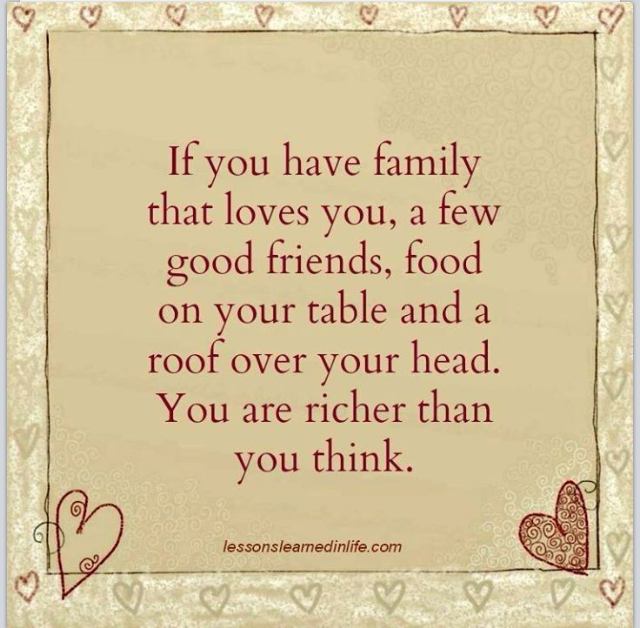 My friend, you are richer than you think! Simply take the time to reflect on your abundance, and watch how you will mutate into a better version of yourself! Good post. I learn something more difficult on completely different blogs everyday. It would at all times be stimulating to read content material from other writers and apply just a little one thing from their store. I’d prefer to make use of some with the content material on my blog whether or not you don’t mind. Natually I’ll provide you with a hyperlink on your web blog. Thanks for sharing.